This article, by Jonathan Yates, is reproduced from Queens’ College Record 2003, with minor editorial updates by Robin Walker 2018. During a recent spring clean at our headquarters in Cambridge I came across an old Scout flag. On one side a boar’s head, on the other the words “IXth Cambridge Queens’ College”. That Queens’ once had its own Scout troop will probably come as a surprise to most members. In fact Queens’ played a major role in the early years of Cambridge Scouting. The Scout Troop itself was initially composed of boys from the choir and its mainstay throughout its long existence was the Rev. C.T. Wood (1875–​1961). Charlie Wood was a Fellow of Queens’ from 1900 and sometime Senior Chaplain, Dean and Director of Studies in Theology. Robert Baden-Powell never set out to form the Scout Movement. When he wrote Scouting for Boys in 1907 he hoped his ideas would be taken up by existing youth groups such as the Boys Brigade. However the young people had different ideas and from 1908 all across the country groups of boys formed themselves into Scout troops and persuaded adults to become leaders. Cambridge was no different and by 1909 several Scout troops had sprung up across the City. Leonard Spiller (Queens’ 1909) brought the Scouting fever to Queens’ and, in the winter of 1909, seven Queens’ undergraduates started a troop in the Barnwell area of the City. In May 1910 Charlie Wood invited all the Scouts in Cambridge to a memorial service for King Edward VII in the College Chapel. The following week the choir boys were formed into two patrols and attached to the 1st Cambridge Troop led by Reginald Wright (Queens’ 1909, died 1911). The choir patrols became known as the “Queens’ Own” and during the summer were formed into their own troop, the 9th Cambridge—Queens’ College. Charlie Wood was appointed chaplain to the Troop. Initially the Troop met in an empty room in College, but in 1917 moved to the Albert Institute in Grafton Street. In July 1913 the Troop had its first summer camp at West Runton near Sheringham. The following summer the Troop again camped at West Runton with Arthur Hamer (Queens’ 1913) as Scout Leader. The camp ended just three days before the outbreak of the Great War. Arthur Hamer immediately offered for military service and, tragically, was killed just five days before the Armistice. In 1914 Charlie Wood took over as Scout Leader, a position he would hold for nearly fifty years. Soon afterwards he also took on the role of District Scout Leader for Cambridge, which made Queens’ the natural centre for many scouting events. In 1917 Robert Baden Powell paid his first visit to the College where he chaired a debate on the role of the Scout Movement. His arrival was delayed by several hours after a German bomb landed in front of his train at Liverpool Street Station! When General Smuts visited the college that year the Scout Troop formed a guard of honour across the Mathematical Bridge. With the national shortage of labour the Troop’s summer camp in 1917 was at Impington where they spent a month fruit picking for Chivers. The following year six weeks were spent picking flax for the Government at Fotheringhay in Northamptonshire. In 1923 Charlie Wood was appointed Scout County Commissioner for Cambridgeshire. Despite this important and time consuming job, he still found time to run the Troop. The highlight of the scouting year was the summer camp (as it still is today!). Over the coming years the 9th camped in Jersey, Harlech, Langdale, Val d’Iére and also returned many times to West Runton. We still have many photograph albums from these camps. In June 1922 Baden-Powell was again in Cambridge for a rally in Queens’ Grove. 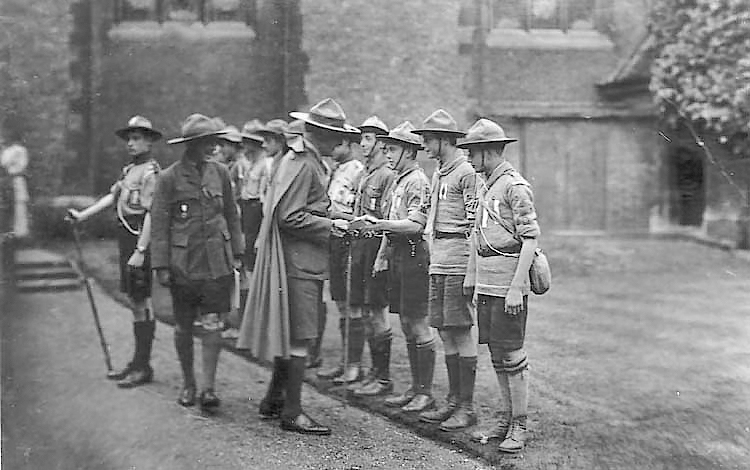 The picture shows Baden-Powell inspecting King’s Scouts from the 9th with Charlie Wood watching on. The Scout boat club was formed in 1923 on Charlie Wood’s advice. It has the rare distinction of starting from last boat and reaching Head of the River in the town bumps without being bumped. 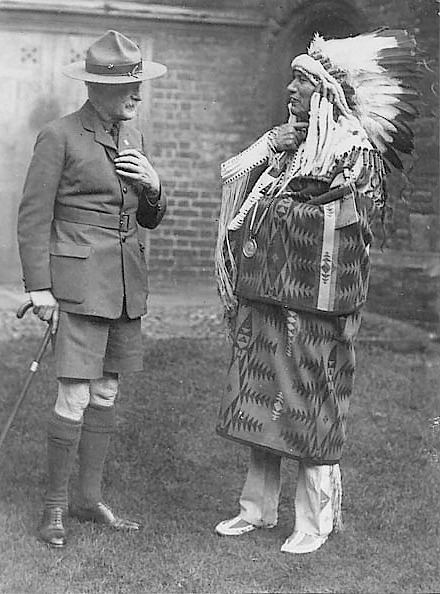 1928 saw Baden-Powell back at Queens’. His guest on this occasion was Dr Eastman, chief of the Sioux Indians. He appeared in full regalia and clearly made a big impression on the assembled scouts! Charlie Wood retired as County Commissioner during 1940. He also gave up most of his College duties having been Senior Chaplain and Dean since 1907 and teacher of Hebrew and Old Testament subjects since 1900. He became Rector of St Botolph’s and, as a Life Fellow, retained his rooms in Walnut Tree Court. He continued as Scout Leader with the 9th and in 1954 the Troop moved from its headquarters in Grafton Street to the University Cross Country Running HQ off Mill Lane. In 1960 Charlie Wood was in failing health. He rang Alan MacKenzie, Scout Leader of the 11th Cambridge Scout Troop and asked if the two troops could be merged. The combined troop was to be known as the 11th/9th. Soon afterwards in March 1961 Charlie Wood died. His influence is still felt today. He proposed that the Cambridge Scout Association have its own headquarters. As a result premises in Grafton Street were acquired. These were later sold and the present District Headquarters in Perne Road purchased. He was also instrumental in the purchase of land at Abington as a county campsite. Soon after the merger the Troop found itself homeless having lost both the 11th’s HQ in West Road and the 9th’s HQ in Mill Lane to University expansion. For a while the troop met in the rather draughty Castle End Mission on Castle Hill. In 1975 we were finally able to settle in the Newnham area of the city. We rented land from the County Council and, using a trust fund set up by Charlie Wood, built our own Headquarters. Today we’re still in Newnham and the Scout Troop is flourishing. Newnham Scouts — the 11th/9th Cambridge Scout Group — descendants of Queens’ College Scout Troop. 1931: History of the IXth Cambridge (Queens’ College) Troop of Boy Scouts , by Charles Travers Wood [Fellow].